Parking: On-site car park with 100 spaces (payable). 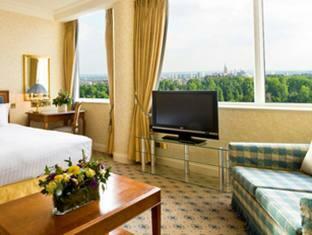 There’s one thing that guests at Lancaster London always seem to agree on - the views are breathtaking. With Hyde Park, the largest of the Royal Parks, directly to the south, and vistas east to the City of London, we have arguably the best views in London. Whether looking down from the hotel’s superior bedrooms - 416 in total - or enjoying the view from the hotel restaurants, it’s as if the heart of this great city is within your reach - and indeed it is! Marble Arch and the plethora of Oxford Street shops are a five-minute stroll from the hotel with Knightsbridge and Harrods just 10 minutes by taxi. The City of London’s financial district is 15 minutes direct by London Underground. Even Heathrow Airport is a mere 20-minute ride on the Heathrow Express from the nearby Paddington Railway Station. Lancaster London certainly puts you at the very centre of this vibrant metropolis. If you've stayed at Lancaster London before, the chances are you will be greeted by a familiar face the moment you arrive - an example of the attentive and professional service that many guests tell us is one reason they come back to the hotel time and time again. Another reason hotel guests return is for the sheer comfort of our air-conditioned guestrooms, all double-glazed to give you a tranquil place away from London’s bustle. But for some, what really sets Lancaster London apart are all those small but important details that make them feel so at home – details like the fluffy white bathrobe awaiting them in their marble bathroom. Full service hotel accomodations with exceptional views of Hyde Park and cityscape vistas make Lancaster London a superb choice for visitors to London. 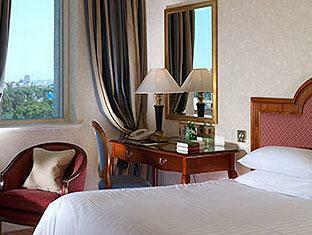 Superior hotel guestroom accommodations at Lancaster London are ideal for the business traveller to London. Many of these give you stunning views of Hyde Park and the London skyline. As well as essentials like TV with satellite channels, comfortable furniture in American oak and a mini-bar, the hotel accommodations have a desk with universal power sockets, Internet access and direct dial telephones with voicemail in a choice of nine languages - all very much appreciated by busy business travellers. They also include complimentary Gilchrist & Soames toiletries in the bathrooms. The en-suite marble bathrooms include power showers. The hotel’s Concierge services complete the attentive hospitality ambiance at Lancaster London. 'For a more spacious hotel room, where accommodation comes with a seating area and easy chair, travelers choose a Deluxe room. These also have a king-size or large-twin beds and a larger bathroom with bidet. 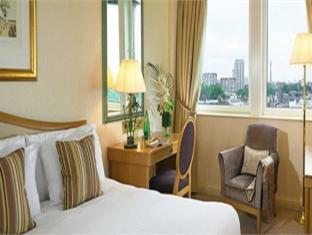 Families visiting London for city breaks especially appreciate the size and comfort of the hotel's deluxe guestrooms. Business travelers enjoy the extra space and calm of these 4 star accommodations when attending conferences, visiting clients or otherwise conducting business in the Capital. Meeting Planners find the selection of spacious guestrooms an excellent complement to the world class Banquet and Conference facilities at Lancaster London. Our Executive guestrooms on the Lancaster London’s top four floors feature large picture windows to let you enjoy the fantastic views to the full. These spacious, 4 star hotel accommodations have a large seating area, separate dressing area and generous wardrobe and luggage space. The Executive guestroom accommodations also have a king-size or large-twin beds and a larger bathroom with bidet. Hectic business executives find the spacious guestroom an ideal setting to wind down from the day’s activities. The proximity of Hyde Park and the Royal Gardens entices visitors to go for a stroll or jog, keeping their fitness routines intact while away from home. For those occasions when nothing less than a suite will do, Lancaster London has 22 Suites to choose from. Each hotel suite has its own unique character. Our Embassy Suites have elegant lounges with deep sofas, walk-in dressing areas and spacious bathrooms. Royal Suites provide you with an elegant dining area for private entertaining adjacent to the comfortable lounge, and views of Hyde Park’s exquisite Italian Gardens. For four years in succession the Lancaster London has been voted Best UK Hotel in the ‘Meetings’ category by the readers of ‘Meetings and Incentive Travel’ magazine. If you’ve already visited Lancaster London, you probably won’t be surprised. Our ability to cater for meetings of just 8, or banquets and events of up to 3000, certainly makes us one of Europe’s foremost and flexible venues, while the professionalism of our meetings and events team has set the benchmark in the conference and banquet industry. 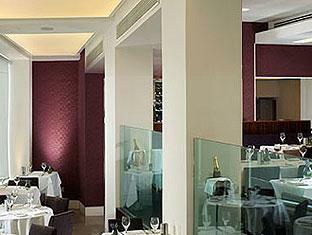 As for the cuisine created in our dedicated banqueting kitchens, it’s in a class of its own. The banquet cuisine, meeting space flexibility and spacious guestroom accommodations are especially suited to host large residential seminars and expos. Add to this our central London location – just five minutes stroll from the West End’s shopping and within easy reach of the City and Heathrow Airport – and you have all the ingredients to make your meeting or event truly memorable. The Nine Kings Suite at Lancaster London is widely acknowledged as Europe’s ultimate venue for product launches, conventions, awards events and exhibitions. Your guests approach the Suite via its own street entrance that leads into a reception foyer with space for 600. Alternatively, we can partition the foyer into three sections for breakout rooms, VIP drinks areas – whatever your reception and event requirements. The main suite is directly adjacent and, with a truly dramatic flourish, can be revealed by raising the dividing partition walls electronically. Within this vast, classically proportioned room – entirely without pillars, with daylight or full blackout – you can accommodate up to 1,000 meeting or banquet attendees. It’s a highly flexible room: we can easily change it from a banqueting to a conference space (the Italian chandeliers retract), or divide it into four separate conference spaces with acoustically dampened partitioning. Huge but highly flexible, the Westbourne Suite at Lancaster London is ideal for events incorporating elaborate technical presentations. It accommodates up to 1,200 or, for private conference syndicates or more intimate receptions, we can use our sound-proofed partitioning to divide the room into four areas, each with its own corridor and separate access. The dedicated entrance guarantees your guests a warm welcome, while the large off-street access makes it easy to deliver equipment directly into the suite. Like the Nine Kings Suite, the Westbourne Suite's integral technical facilities such as load-bearing hanging bars recessed within the ceiling, and 63 amp three-phase power supplies located in every section of the banquet space make life as easy as possible for production companies transforming our space into your dream venue. Highly flexible meeting and banquet space coupled with the hotel’s spacious and comfortable guestroom accommodations, the Lancaster London is ideal for discerning meeting planners and exhibition organisers. Launched in 2005, the Forest Suite at Lancaster London is a collection of thirteen cool contemporary spaces for meetings or functions for eight to 200 guests. Many have stunning views over Hyde Park and the surrounding townscape, and all have natural or secondary daylight. These meeting rooms are equipped with sophisticated lighting and cutting-edge communication technologies, including audio/visual links to the Nine Kings and Westbourne Suites , certainly ideal for breakout sessions or Board Meetings. Stylishly furnished using natural woods and fabrics, they are individually designed to be inviting, calm and businesslike. Beech is the largest conference room in the Forest Suite and can be used as either a single meeting room for up to 200, or can be partitioned into three separate linked rooms. Second largest is Oak, with its magnificent picture windows. 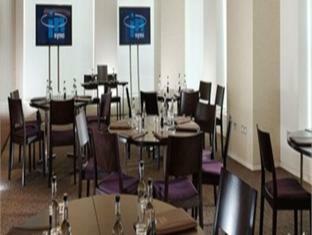 This can accommodate 150 people as a single meeting space, or can be partitioned into three rooms. Willow, by contrast, is three function rooms, with space for 20 in each. Cedar is two rooms, with combined accommodation for up to 20. 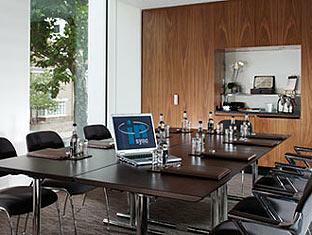 The Boardroom, with its floor to ceiling windows and specially commissioned boardroom table can seat up to 16. The Park Room is our exclusive lunch venue for Forest Suite guests which can also be used for private dining and receptions of up to 120. Last, but not least The Serpentine Room brings an additional unique dimension to the spectacular set of meeting rooms. With a stylish yet simple interior, the room's fresh contemporary style, with Art Deco overtones, decorated with sophisticated fabric and stone panelling in warm tones of beige, cream and chocolate, offers clients an excellent, distinguished event facility. Whether it's for a theatre style presentation, a boardroom or conference meeting or a space for private dining - the versatile room design can be transformed to suit all requirements. Boasting some of the most spectacular and romantic views across the city skyline and adjacent Hyde Park, and superbly located in the very epicenter of the capital with award-winning event facilities and cuisine, the Lancaster London has all the right ingredients for the perfect wedding mix. Housing some of the largest banqueting rooms in the capital, the vast Nine Kings and Westbourne Suites are both ideal for wedding events incorporating elaborate lighting with dining for over 1,000 guests. For smaller more intimate wedding parties, choose from our selection of contemporary Forest Suites - which offer a range of different entertaining spaces with sophisticated lighting and cutting-edge communication technology – for parties for up to 8-200 people. In particular, The Park Room, with its stunning floor to ceiling windows, showcasing a spectacular vista of Hyde Park, provides one of the most unique event settings in London. Completely self-contained with its own welcome area, coat check and state-of-the-art music system, the Park Room can cater for wedding cocktail parties for up to 200 people, or a buffet or banquet for up to 120 people and, with its integral dance floor, wedding dinner dances for up to 90 people. Our two award-winning restaurants, the Modern British, Island (85 cover capacity) and the oriental gem, Nipa Thai (60 cover capacity), can also accommodate your wedding parties. Our award-winning events team, with their impeccable taste, ability to understand your vision and highest professionalism, will ensure that your celebrations run effortlessly. 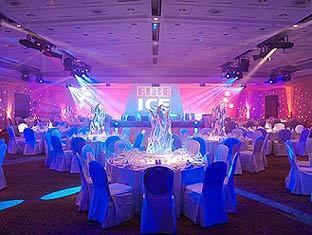 From invitations, flowers, music to photography, our event team can also source your most detailed requirements. While our dedicated banqueting kitchen, under the auspices of Head Chef, Eibhear Coyle, is renowned for its outstanding cuisine and originality. 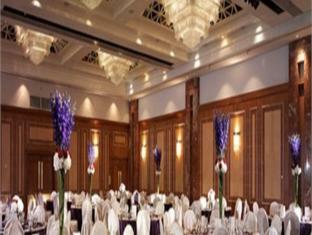 The Lancaster London Hotel is more than London’s finest events and meetings venue. 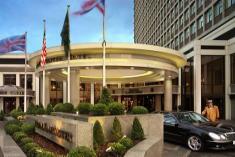 We also offer you all the facilities you would expect from one of the capital’s premier hotels. This includes two outstanding restaurants: Nipa, our Thai restaurant, and Island Restaurant & Bar, a stylish contemporary split-level space with floor-to-ceiling windows overlooking Hyde Park. For traditional afternoon tea, light snacks and drinks, feel free to enjoy the comfort of our comfortable Lounge and Lounge Bar. 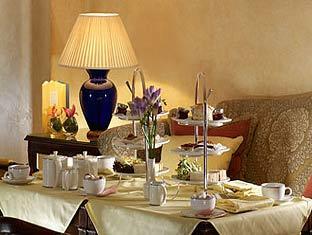 24-hour Room Service has a wide selection of offers and meals available to hotel guests. "'Who would guess that... Lancaster London conceals this serene, authentic gem of a Thai restaurant? You'll quickly forget... the traffic below as you gaze over verdant Hyde Park from the compact, wood-panelled, flower adorned dining room. Head chef (Ms) Nongyao Thoopchoi produces a first-rate menu that incorporates... Thai delicacies alongside all the familiar staples that are... precisely cooked... with super-fresh ingredients. The long menu gives you plenty of excuses for repeat visits. Service is typically Thai and perfectly dignified." An ice-cold beer, an exotic cocktail, quick comfort food or a fabulous three-course feast? With its stylish, contemporary interior and superb views across neighbouring Hyde Park, Island Restaurant & Bar offers it all with an excellent selection of Modern European dishes, cocktails and wines to suit every taste and appetite. The all-day menu ranges from Brit classics such as brilliant homemade prime Scotch beef burgers and beer battered haddock with chunky chips and Grain-fed Casterbridge steaks and grills, to more cosmopolitan choices such as: pan-fried fillet of red mullet with shellfish risotto; rump of lamb with olive oil mash and nicoise jus and a tasty selection of risottos and pasta. Puddings include: a warm chocolate pudding with praline parfait; cherry and almond tart with clotted cream and a stunning rhubarb cheesecake with orange ice-cream. An impressive list of cocktails and wines from the New and Old World complete the feast - and with its uncompromising attention to detail, friendly staff and atmospheric interior, Island is the perfect choice for those who just want a quick snack or something a little bit more. Located just a few moments away from Kensington Gardens and the famous Peter Pan statue, Lancaster London is the perfect venue to relive the enchanting never-ending story. Each afternoon tea is served with a map to direct guests to the Peter Pan statue in Hyde Park, and a fairy dust pouch filled with breadcrumbs to feed the ducks when they arrive in the park.